I bumped my older thread but got no response so I figured I would start a new one. I bought the new countershaft bearing for my m46. From reading the haynes manual it looks like I need to take everything out to get to the layshaft and then replace the bearing. The old bearing is there but is missing the race. It rolls fine but seems to be aged. Could I put the new race I have on there or would it be asking for trouble? Is there a way to replace the bearing without tearing into the entire thing? I think I would rather find another one that works if I have to tear the whole thing down since it seems like it would take a lot of time. Picture is of the current countershaft bearing. Do you still have the spacer / washer for the main bearing? 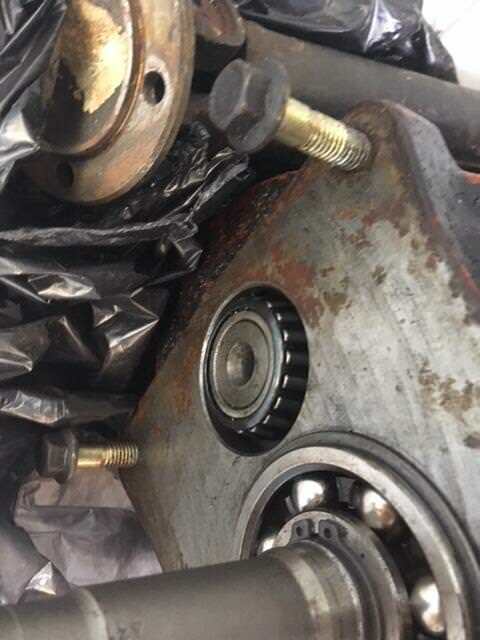 There's no way to get the tool behind the bearing without removing the countershaft. Just slap in the new race, install the correct shim and be done with it. Yeah thats what I was thinking that I couldn't get a bearing puller behind there. Alright sounds like I'll just put the new race in and see if it goes. If not then I'll find a nicer used one. Thanks. If you have trouble finding a good used 1, the parts to rebuild your M46 are still available. And my brother, hiperfauto, has rebuilt a few, 2 in the last year and we have all the tools and parts needed to rebuild them. The website is down due to us paying for what we get, or rather not paying. A friend was hosting the site for free since the server had to be up and running for his business anyway and there was plenty of room available. All good things must come to an end and so it is with the free hosting. We're now with Go Daddy and my friend is having difficulty migrating the software and allowing public access to the database. He's busy with his new endeavours but he's assured me he'll be working on a solution to the problem soon. What does an m46 rebuild cost? The last one we did was ~$1160. That included new lay and main shaft bearings, synchros, shift dogs and springs for the trans and a reseal for the overdrive. The bearings in the overdrive rarely need to be replaced. Any hard parts needed are additional. I have a known good center section for $85 plus the ride.